Due to various attenuating factors in the recording and reproduction process (e.g. surface loss, gap loss, etc. ), which affect short wavelengths (= high frequencies) more than longer wavelengths, the frequency response of the magnetic flux on tape cannot be held linear. The recording process follows standardised equalisation curves, which differ according to standard family (IEC or NAB) and recording speed. In order to achieve a linear over-all (= recording-replay) frequency response, replay amplifiers must be calibrated to respective recording equalisations. Equalisations have developed over time. Due to improvements of tape formulations and in tape properties, the crossover frequencies have continuously changed. Thus, earlier recordings must be replayed by applying the correct historical standards. The overlapping of old and new standards should be taken into account when replaying tapes recorded in times of transition. 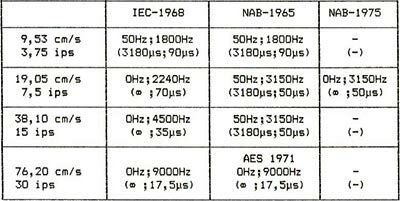 Most analogue tapes are set to standard playback equalization curves, either that of the NAB or the IEC. Be aware of different equalisation standards for professional and consumer equipment at 19 cm/s tape speed. Engel, Friedrich: Schallspeichherung auf Magnetband. Agfa-Gevaert, Leverkusen 1975. Van Bommel, Peter: Die Entzerrung in der magnetischen Schallaufzeichnung. Agfa-Gevaert Leverkusen 1973.